You are planning a marketing campaign or other changes to your business and projections based only on past sales are not reliable enough. You are receiving new products and would like to manually enter the initial demand for them. To override the forecast, check actual sales and edit the forecast override accordingly. 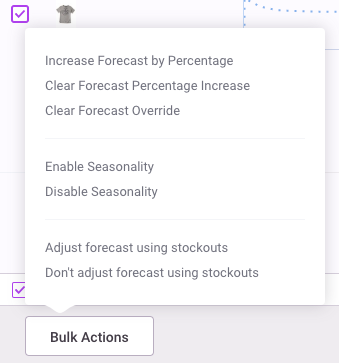 Entering the forecast override updates the planned sales (used for replenishment recommendations). You can also specify the forecast percentage increase which is applied for the forecast override (if set) or for the automated forecast. The final result is shown in planned sales. To make changes in bulk, select some products using checkboxes on the left. Top-Down tabs allow to check and review the aggregated forecast for products, categories, vendors, and the entire store. This forecast can be overwritten and reconciled with variants. Enter your forecast override in units then save changes to update the forecast override for variants from the aggregated forecast using automatic forecast distribution. For example you have two products in a category. The automatic forecast for these products is 10 and 20 units for December. The bottom-up forecast for the category is 30 units (10 + 20). When you override the top-level forecast to 60 (+100%) and save changes to variants it makes it 20 and 40 respectively.